David Villa became the first player recruited by NYCFC in June of 2014. Having just finished a successful campaign with Atletico Madrid, winning La Liga, he chose to embark upon an adventure in The Big Apple. He called it “an irresistible project” but his unveiling appeared incongruous, a low-key, disjointed affair. Villa hardly spoke any English and used a translator. Yet he was installed as the captain of this newly founded club, that no-one could quite yet place. A Spanish legend, Villa is the all-time leading goalscorer for his country. Villa spent time at Sporting Gijón and Real Zaragoza before signing with Valencia. He was named the Spanish Player of the Year in 2005–06, his first season with the club. Replacing Zlatan Ibrahimovic at Barcelona, Villa won three of his four La Liga titles with Barcelona and Atlético Madrid and captured the 2010–11 Champions League crown with a goal that defines his career at club level. Villa scored five goals at the 2010 World Cup and four goals at the 2008 Euros to help Spain capture those two trophies. He has registered more than 90 caps with La Roja since making his debut in 2005. Almost four years on from the free transfer deal that brought him to New York, David Villa has shown exactly what a designated player should be. He has become a trailblazer, an emblem of all that’s good in MLS. “I’ll try to be a leader day-to-day’, Villa said during a promotional appearance at the adidas store in Manhattan last year. He has been as good as his word and he celebrated his hundredth appearance in MLS for NYCFC, as one of the most recognisable faces in US Soccer. “I am so proud. 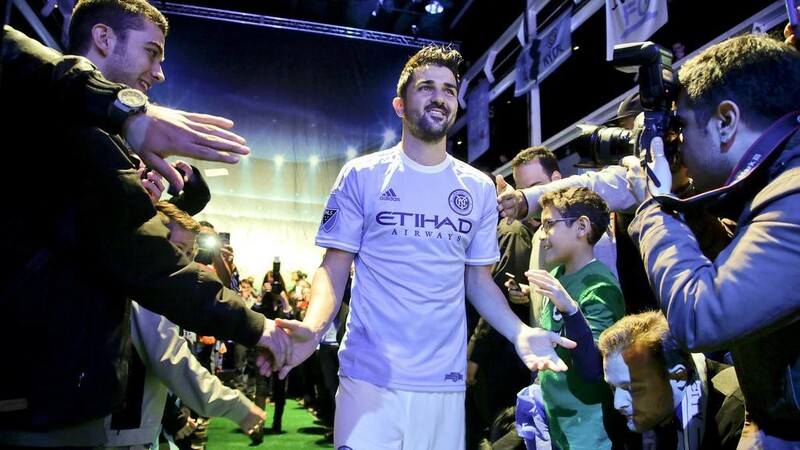 I am still fighting,” Villa said in a post-match locker room speech following that hundredth MLS game for NYCFC on 11th March 2018, where he scored the decisive goal in a 2–1 win over LA Galaxy. David Villa has fully embraced his central role at a club that is being built from ground up, and in so doing he has dispelled the reservations of those that feared he lacked the personality or profile to flourish as a marquee signing at a newly-formed club. Until recently, the league’s foreign imports, the so-called designated players of MLS, were big European stars, veteran players in search of a last big pay day before retirement. MLS made these signings in good faith, as they considered it to be a way to bring more fans into the stadium. David Villa may have matched the onfield achievements of the best of them at the top of the game, yet he lacked the universal appeal of a Thierry Henry, a Frank Lampard or a David Beckham or even the cult hero status of an Andrea Pirlo. This did however ensure that the Spanish forward was never going to become a victim of hype. No one expected David Villa to put his stamp on the league and he has done so largely without pressure. So, for David Villa to earn a call-up to re-represent La Roja in September 2017, three years after his retirement from international football, is a fantastic accolade for a player who is said to inspire everyone around him with his work ethic and drive. Upon his inclusion in the squad for the 2018 World Cup qualifiers in August 2017, Spain’s coach Julen Lopetgui was is no doubt as to Spain’s need for Villa. And this call-up has also been a fillip for MLS as it looks to establish its credibility as a top international competition. “We felt we needed him now and we think he will help us. He is having magnificent performances with his team and he is very motivated”, Lopetgui said. “It’s true that he comes from a different league [MLS] but that is the way it is. I have spoken to David and we have seen him play. Villa has not only earned a revered status among the NYCFC fans from his on-field exploits, he has also made himself at home in his own unique, unassuming way. This has set standards for what a designated player should be as an ambassador not only for the club but also to the league and more importantly for the wider game of US soccer. Video: Why worry when you have David Villa? According to NYCFC’s Director of Football Claudio Reyna, David Villa has never so much as taken a day off. This dedication reflects in his numbers too. His vital statistics read: 18, 23 and 22. These are the number of goals he has scored in MLS during the last three seasons. David Villa also won MLS’ MVP award for 2016 amongst a number of individual awards. It is more than fitting that this season he opened his account with a goal against LA Galaxy, as he racked up his century of MLS’ games, in front of the adoring home support at Yankees Stadium. But really no one should be especially surprised. The two-footed striker’s career has been built on overcoming adversity and proving his doubters wrong, since childhood. Naturally right-footed, the player’s equally strong left foot is a legacy of the retraining that followed a serious injury aged 4 that threatened to render his prospects of a career stone dead — before they’d even begun. He was written off as too small by youth coaches and local clubs like Real Oviedo, that questioned the extent of his potential. He finally got his professional break at his local club Sporting de Gijón, the erstwhile home of his schoolboy idol Quini. Goals were never a problem for Villa, but Pepe Acebal, Sporting’s manager, claimed that Villa initially lacked the stamina to sustain an impact and had to be used sparingly at first. Confirming the impression that has defined the little forward’s glittering career for club and country, Acebal confirmed that Villa’s capacity for work was “unrivalled”. In truth, David Villa has evolved into one of the ultimate modern forwards and a player that at various times, has played without detriment in every front six role. Always an opportunistic predator, he can also finish powerfully with either foot, inside and outside the area. A free kick and penalty specialist on account of his crisp technique striking a football, Villa is also a quick, agile, and mobile team player, with the ability to create and convert his own chances. Renowned for his intelligent offensive movement, so beloved of his great admirer Johan Cruyff, Villa is just as likely to be found creating space for teammates, as he is carrying the ball box to box without breaking stride, or making those trademark darting runs in behind, in pursuit of a threaded pass. Due to his vision and passing ability, Villa is equally at home dropping off the front to link the play with midfielders, and to turn provider for his colleagues. In addition to his trademark role as a diminutive number nine, at various points David Villa has been deployed as a second striker, as an attacking midfielder or as a wide player during an illustrious career. Taken together, this versatility allied to a winning mentality and the leadership qualities that have blossomed in New York, it is a package that makes David Villa a supreme teammate. He is also the perfect fit for Patrick Vieira’s NYCFC, for whom he is the beating heart and the coach’s onfield embodiment, albeit in a wholly different guise to his boss. And now, ahead of Saturday’s game with Orlando it is the same words of David Villa’s original ‘underwhelming’ press conference that resonates with the authority of a manifesto now. 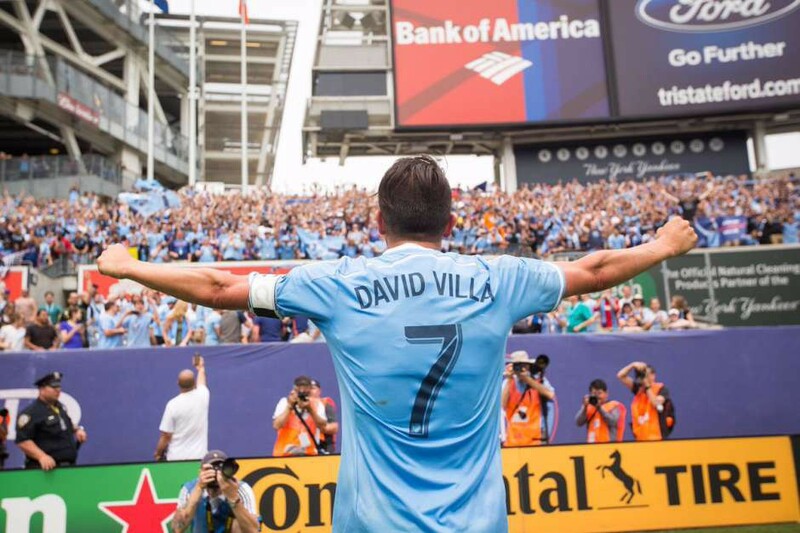 “I want to leave a winning legacy, one of hard work and dedication so people remember the name David Villa,” he said on the day he signed for NYCFC. Three and half years later, the man from Langreo, Asturias has already achieved that objective. And when he finally retires, David Villa will leave behind a legacy that can be a rich source of inspiration both for MLS and also for players that cross the Atlantic in his stead, emboldened to experience US soccer first hand for themselves. Greg Gordon is a Next Opponent analyst and journalist whose work has appeared in The FT, The Observer, The Sunday Times and leading international publications.